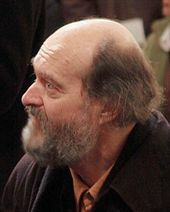 Arvo Pärt (born 11 September 1935) is an Estonian composer. He wrote a large amount of religious music. Pärt is sometimes called a minimalist or 'holy minimalist'. The first piece he wrote used a style called serialism. He is influenced by the sound of Gregorian chant, and has created his own technique for composing, which he calls tintinnabuli. ↑ "Biography". Retrieved 6 February 2013. This page was last changed on 16 May 2013, at 16:28.